Removes grease, soil, stains and watermarks. Visibly reduces dullness and scratching. Enhances natural color and veining. Safe for use on granite, marble, quartz, onyx, travertine, limestone, slate, laminate, ceramic, porcelain, tile, fiberglass, and any non-poros hard surface. Brands: Corian, Formica, CaeserStone and Silestone. Removes grease, grime, watermarks and stains from all sealed stone and solid surface countertops. Leaves a polished, steak free-shine. Enhances natural color and gloss. Recommended for use on countertops, laminate furniture, sinks and vanities, microwaves and patio furniture. Specially formulated to clean, brighten and protect sealed stone surfaces. Removes grease, soil, surface stains and watermarks. Enhances natural color, veining and shine. Safe for use on granite, marble, quartz, onyx, travertine, limestone, slate, laminate, ceramic, porcelain, tile, fiberglass and any non-porous hard surface. Brands: Corian, Formica, CaeserStone and Silestone. Specially formulated to shine, brighten and protect sealed stone surfaces. Instantly shines dull, faded countertops. Restores natural color, veining and gloss. Removes watermarks and surface stains. Protects against staining and discoloration. Provides an invisible, protective barrier that prevents water and oil based soils from penetrating and staining stone surfaces. Water based: low VOC, does not need to be heated. Non acidic: safe for use on surfaces that will etch (ie. polished limestone and marble). Good stability on alkaline surfaces (ie. concrete, grout, masonry). Vapor permeable: will not crack or freeze when used on outdoor surfaces. Safe for use on granite, marble, limestone, concrete, masonry, saltillo, tile, clay tile, stucco, terrazzo and wood (including pressure treated lumber). 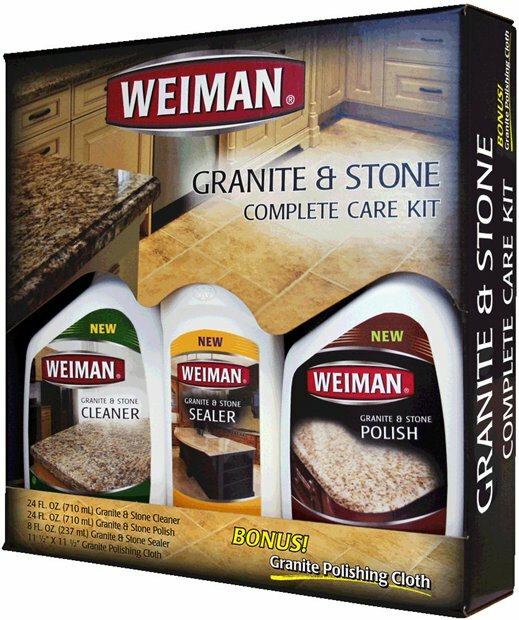 The Granite & Stone Complete Care Kit keeps stone surfaces vibrant, shiny and protected. Excellent for kitchen and bathroom countertops, floors, shower stalls, tiles, fireplaces, entryways, vanities & any solid stone surface.